Bright and likeable, seven-year-old Steven Stayner always listened to his mother. Especially about talking to strangers. But when soft spoken "Reverend" Parnell asked to speak with his mother about church, Steven guessed it would be okay. Until he got into the man's car. By then, it was too late. Held captive by convicted child molester Kenneth Eugene Parnell for seven years as his "son Dennis, " Steven was forced to endure abuse so terrible that he forgot his own name. Parnell evaded a statewide search for Steven, keeping his young prisoner moving from one cheap motel to the next. Finally, Steven made a desperate escape with five-year-old Timmy White, another kidnapped boy, returning home to their parents, then courageously testifying to convict Parnell for his inhuman crimes. 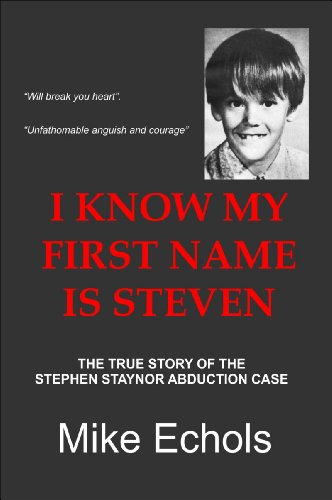 The basis for the blockbuster TV movie, "I Know My First Name is Steven" is the compelling true account of Steven Stayner's seven years of horror and his parents who never gave up hope for his safe return. It is also the complete, updated story of how Cary Stayner made headlines of his own -- as the cold-blooded killer who terrorized Yosemite.